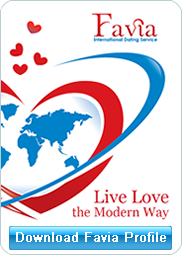 Favia is an international introduction agency with many years experience in service and many success stories.Favia Introduction Agency has established a solid reputation in successfully bringing people together through one to one personalised introduction service and professional dating advice and assistance. Favia offers safe and sophisticated way of meeting like minded people with a view to a deep and lasting relationship. Here you will find a list of free services available to each client who has completed our registration. No payment or credit card information is required from free members. Our membership programs are uniquely designed to suit the needs and level of commitment of different clients. They serve as a basis on which we build upon the individual experience of each client. If you and the girl you have been corresponding to decide to meet in person, we would organize your trip to Ukraine at a mutually convenient time. We will take care of all your travel needs so that you have nothing to worry but enjoy your trip to Ukraine. We provide a wide range of additional services to suit every client’s needs and requirements.